We just released two new features onto Sites at Penn State. This is a new plugin which when activated gives you the ability to clone your site onto a new site or replace an existing site. All pages, posts, menus, attachments, users, plugins and theme settings (basically everything) will be duplicated to another site. This must first be activated by going to Plugins and then activating the Site Cloner plugin. 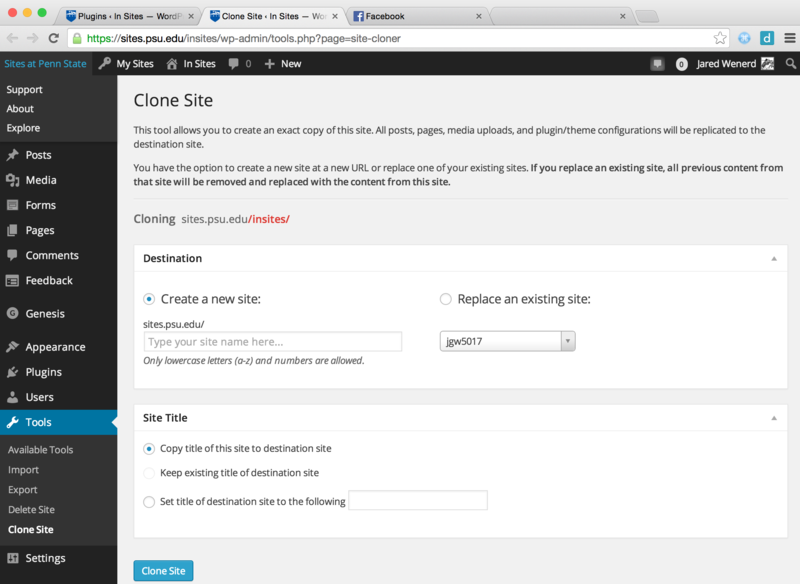 Once activated you can clone your site by going to Clone Site found under the Tools menu. This is a new shortcode activated for all sites on Sites at Penn State. This allows users to display a list of blog posts by including the [​display-posts] shortcode. This can optionally use the arguments to query based on tag, category, post type, and many other possibilities. For detailed documentation on the Display Posts shortcode please see the official WordPress.com documentation. Is Site Cloner still available? I can’t find it in the plugin list but I’d like to duplicate one of my sites.